First, I got this sheet music for 25 cents at my local ReStore. They’re Easter hymns…perfect! I let this dry, and then put it under some heavy books overnight to flatten it out. Then, I cut them out, and I smeared some ink on the edges of the letters to give it a little bit of an aged look. My husband had the idea to tie in the music notes to spring…birds! Perfect! 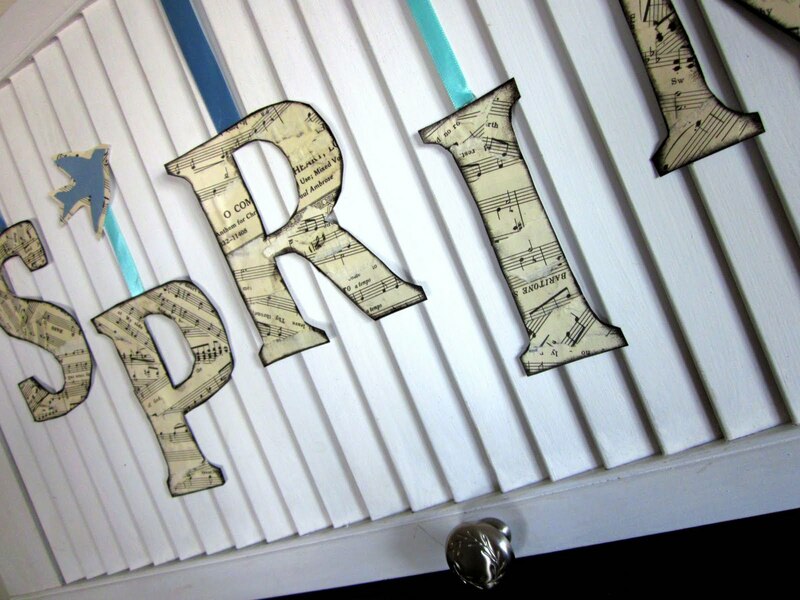 So I mounted them on some of the scraps of sheet music, and it made it much better! I’ll be linking to the great parties at the right side of my blog…go check them out! What a lovely craft! It made my heart sing. I too was thrilled to welcome in spring! I love sheet music projects, although I don't have any of my own. Everyone seems to do the same sheet music projects, so I like seeing a different one like yours. It's very cute and whimical by the way you have the letters hung. Thanks for sharing! Where do I start? This is adorable! I just love your idea. You could use the sheet music and do a Christmas one too…spelling something else of course! Hahaha…great post. Absoultely gorgeous! and I love that your husband contributed too! What a fun, happy project. I've been dabbling with sheet music myself, so I may try this. I just found your blog from K's and I love it! What an excellent idea, I am seriously going to try to do something like this because I think I have a lot of the stuff. I am your newest follower! that's really cute, love the birds! 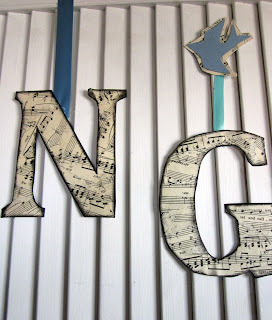 I love shutters…and sheet music and the little birds are so cute! 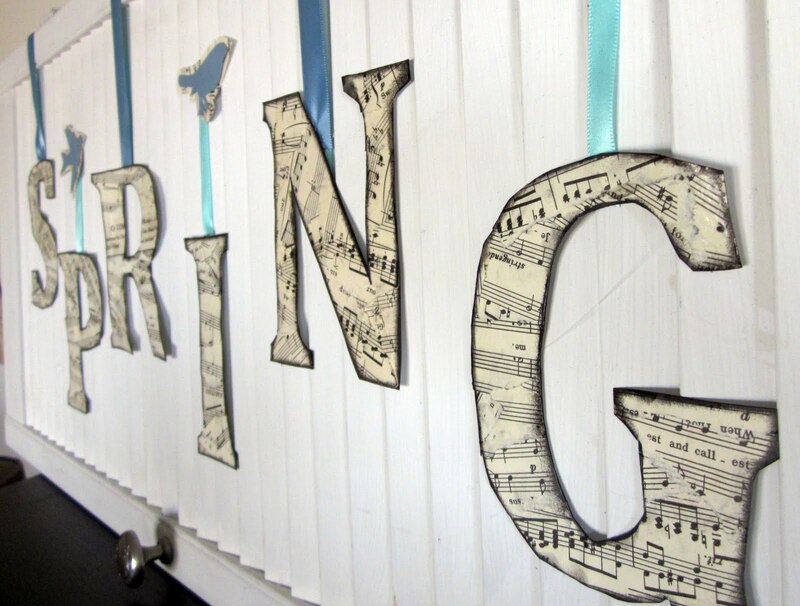 You're very creative…great job on your spring decor! Hey that's is really cute. I am a new follower! What a great idea! I have a shutter in my stash. Hmmm…your giving me ideas. 🙂 Thanks so much for linking up to Terrific Under Ten! So cute! Love the music sheet letters! I love this!!! I love that it is torn up first and then made into the letters! Super duper cute! I am loving this idea and might just have to use it in my own house! Oh, this is adorable!!! What an inspiration your lovely creation is! Sooo cute! And hubby's idea was a terrific way to embellish your creation! He gets a big "high 5" from me. You project sings Spring, but I Shutter to think how cold it is here in Ohio. Seriously love the layout, stencil and cut lettering. I would've done it the hard way first! Thanks for shaving off about five hours for me. the sheet music is really pretty. I love how you used the music sheet. 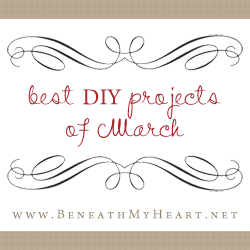 I would love it if you linked your project up to More The Merrier Monday. Love, love, love! My husband is a musician so the project "spoke" to me. And hey, spring makes me sing! It's really pretty – thanks for sharing the great tutorial! Love!!! Very cool the way you hung them. Such a pretty spring project. 🙂 Thanks for sharing! What a fun, cute, craft! Turned out really good.